In spite of this I had never happened to read some of his masterpieces. Sejanus deserves to be called one of these, and is an astonishing play. This is an everyday shampoo. 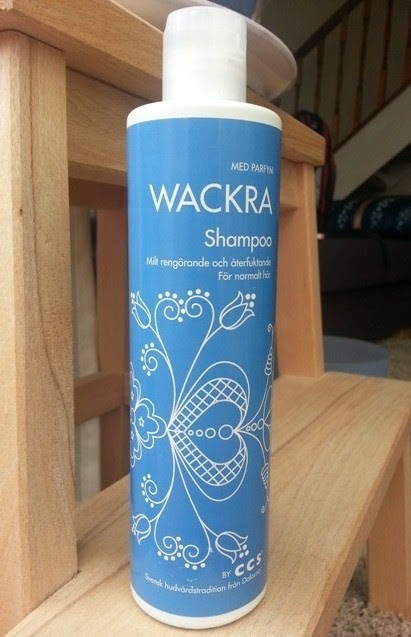 "Swedish hair-care tradition from Dalarna", says the bottle. The county of Dalarna, romantically rural but not too remote from Stockholm, has desirable connotations and is often thought of as the home of folksong; a sort of hyperreal heart of the Swedish nation, as exemplified by the painted wooden horses (dalahästar) that you find in airport souvenir shops, or the idyllic domestic paintings by Carl Larsson that you find on calendars. Here these idyllic connotations are helped along by the fanciful floral design on that very traditional Swedish shade of grey-blue. In Sweden there is, or is imagined to be, a continuity between nineteenth century folk art and tasteful modernist design: in the UK the discontiuity is felt to be stark. This sense of integration with the folk-past has very profound implications for Swedish life and for its economy. It is one of the main stories that Sweden sells to the world. It sells it to its own people too. 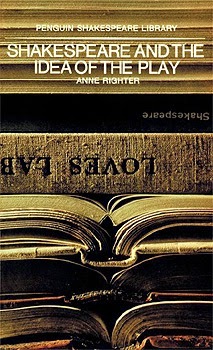 Anne Righter (née Bobbyann Roesen, later Anne Barton, 1933 - 2013) is mainly remembered for this book, her first. When I bought it recently (from Oxfam, because it was the cheapest book in the shop), I imagined hopefully that it would talk about the conception of the play that was shared by Shakespeare, his fellow-actors, and their audiences. Of course that conception could only be discovered by inference. But Righter sticks to a narrower and more directly accessible topic, Shakespeare's use of the play-image within the plays themselves. And, after all, this rigorous concentration does lead to interesting results. The principal one of which, is that Shakespeare's play-references grow to a sort of apotheosis of positivity around 1600, with the chorus speeches of Henry V* and the troupe of players in Hamlet, before then turning negative in character (the poor player who struts and frets). The negativity being especially apparent in Troilus and Timon. Righter concludes that after 1600 Shakespeare experienced a growing disillusion with the stage; so her book is in effect a late contribution to the Victorian notion of Shakespeare's "dark period". But she links this observation to the history of the Elizabethan drama as a whole. 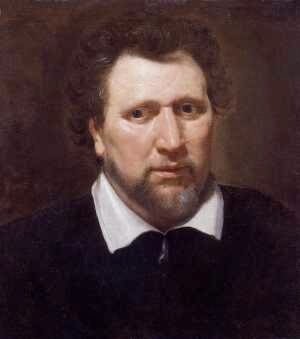 After a long period of development from medieval drama, involving both disintegration and reintegration, a certain high point of naturalistic drama was attained (above all in Shakespeare), then something curdled and then came the transformation into masque which is echoed in certain ways by the elimination of naturalistic illusion in Shakespeare's last plays. *To be accurate about this, Righter suggests that the Chorus's self-deprecating references to the "Wooden O" etc might mark the beginning of Shakespeare's disillusion with the stage. But I see the speeches as really glorying in the incredible things the stage can do, albeit by recruiting the audience's imagination. takes off into the air. yet the pages are blank.